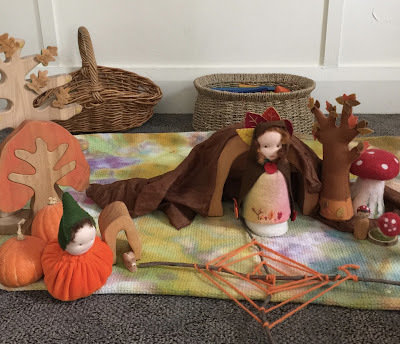 Autumn was very mild at first this month, but toward the end saw night temperatures dropping below 10 degrees celsius, and in some areas the first visit from old Jack Frost. The leaves changed colour beautifully this month, and because of the calm, still weather, the leaves hung onto the trees well into Autumn. Our complete collection of seasonal Autumn verses can be found <here>. 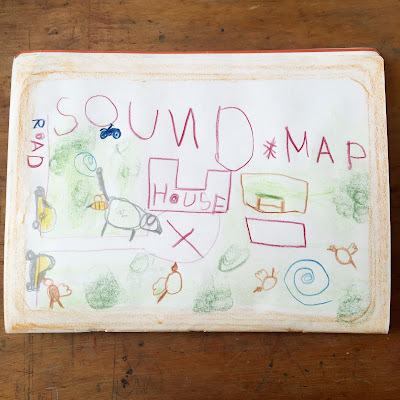 We read Chapter 8 of our Form Drawing story this week which can be found <here>. 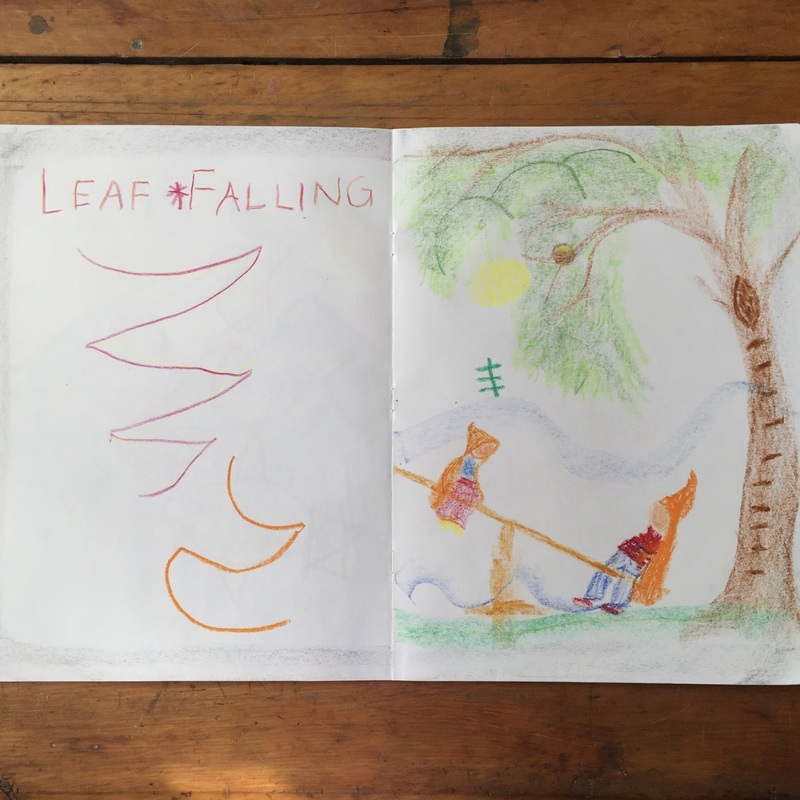 This week we practised a form called 'Falling Leaves'. Mr 5's Kindergarten story was a version of 'The Anxious Leaf' and we continued the theme of 'Autumn Leaves' this week. 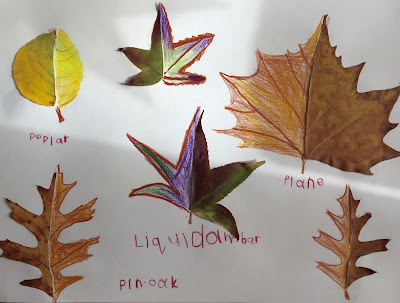 We spent a few lovely nature walks collecting Autumn leaves from the garden and local parks, and brought them home to study the different types, colours and shapes. 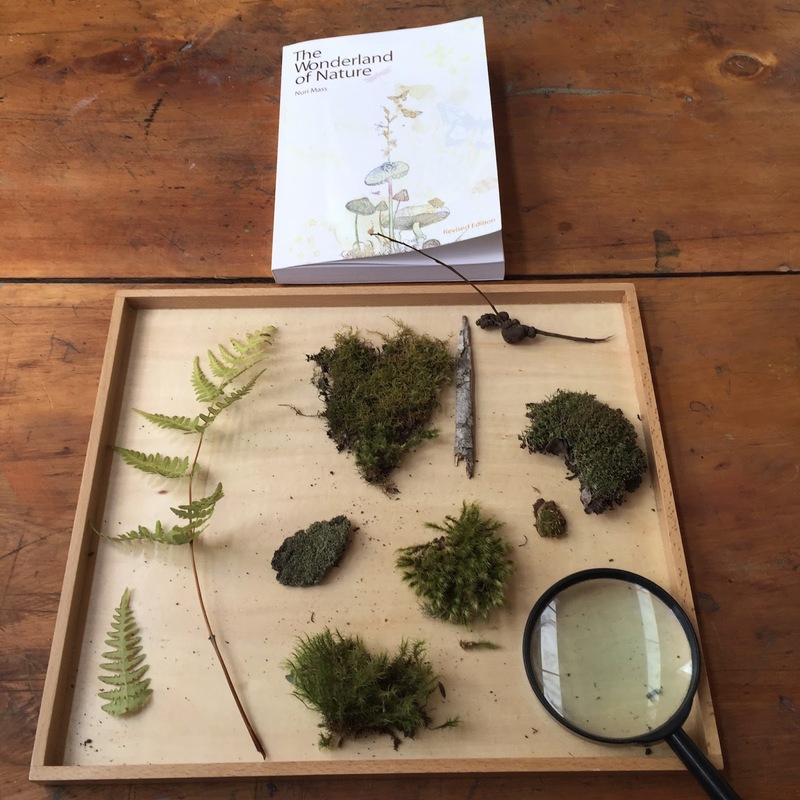 We also observed that our native plants are in the most part evergreen and that the only true Autumn-turning deciduous plant in Australia, the Deciduous Beech Nothofagus gunnii, or the Fagus as it is known here, is found right here in Tasmania and begins turning colour in April. 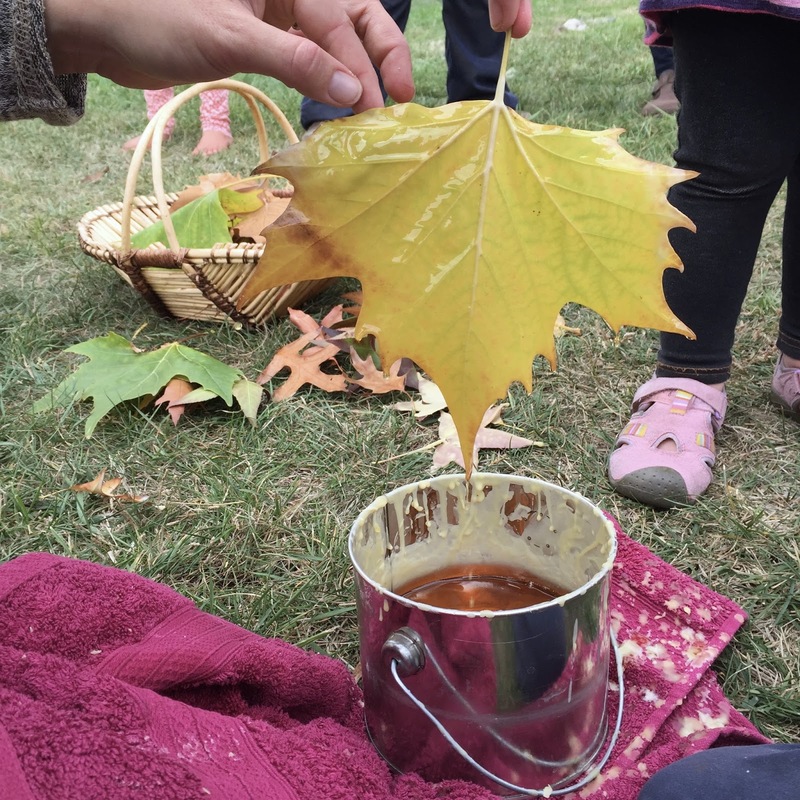 We used the beautiful deciduous leaves we collected for leaf rubbing and wax paper window hangings. 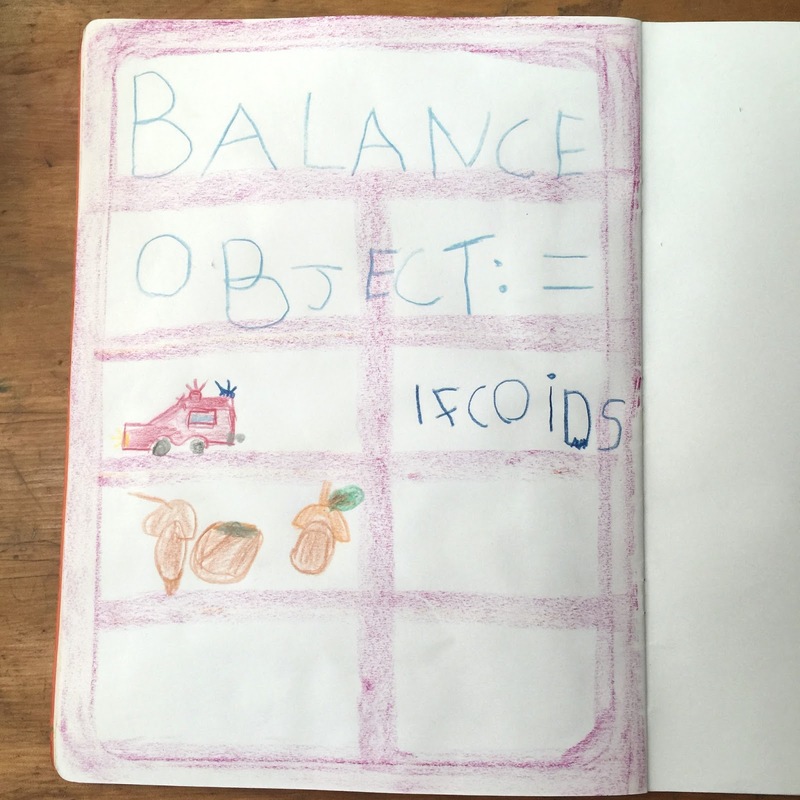 Mr 7 finished up his Grade One 'Quality of Numbers' work with the Number 10. 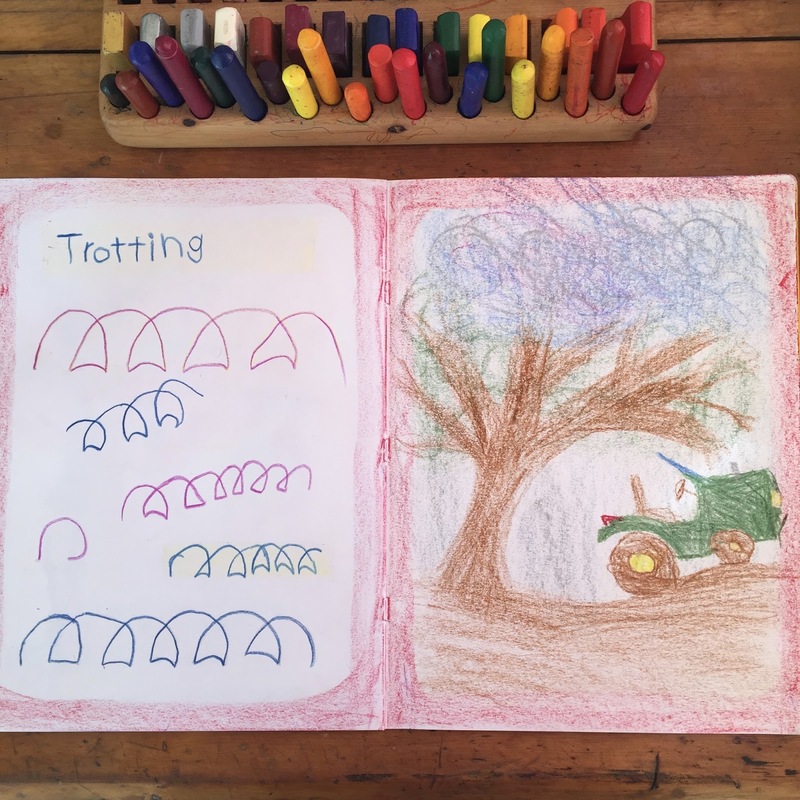 We used the Liberian folktale '2 Ways to Count to 10', a lovely story about skip counting, which is found in the Earthschooling Curriculum. We also discussed different ways we use ten in counting, measuring and daily life. We looked at decapods. We learned about decades. 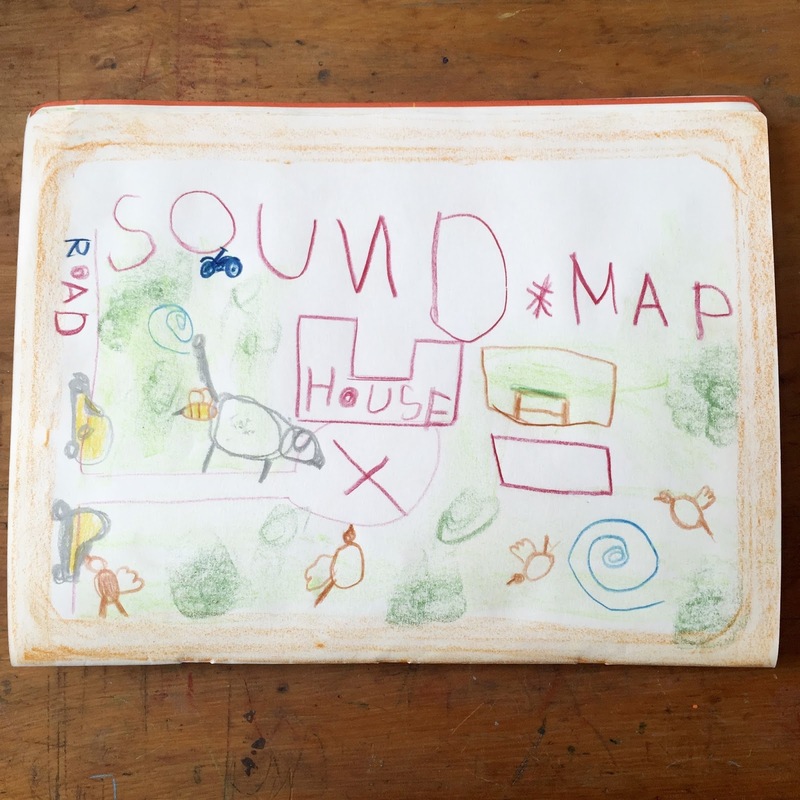 We also really enjoyed learning about decibels and using a decimetre iPhone app to record the decibels of various sounds we commonly hear. We also learned a little about Australia's decimal currency, though we will revisit this later in the year. 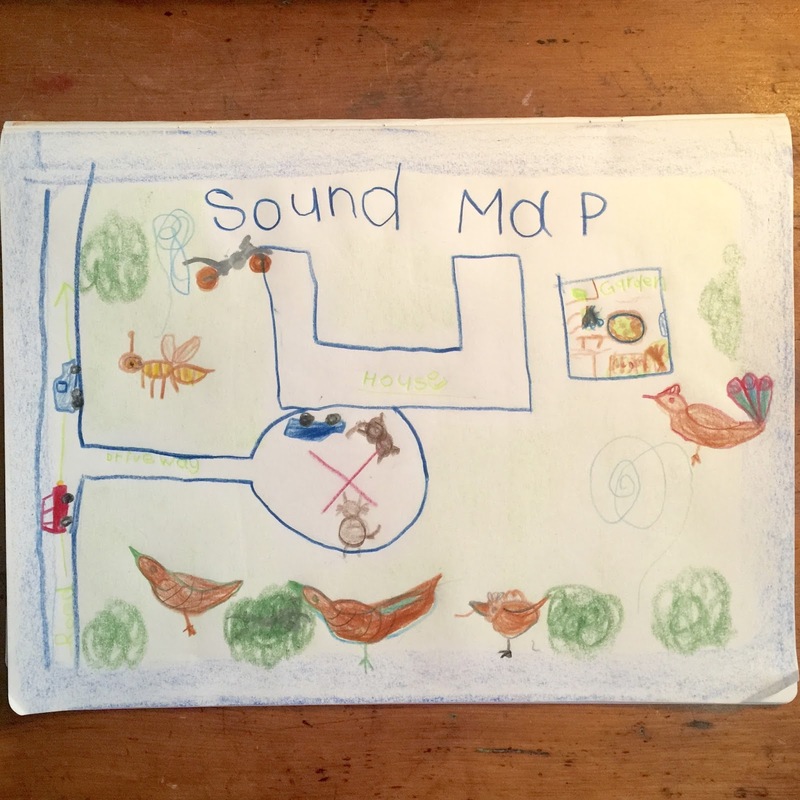 Furthering our exploration of sound, we drew a Sound Map of sounds we could hear from a position outside our house. This was a really fun activity. 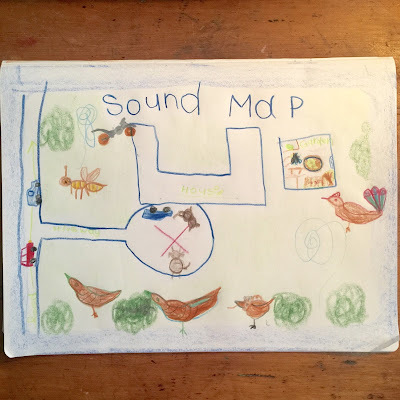 We sat still and listened for 15 minutes, identifying and recording sounds and the direction we could hear them, and then wrote up a good copy in our MLBs. Mr 7's April calendar entry. Both boys decided to draw a collection of African animals inspired by the Liberian folktale '2 Ways to Count to 10'. Here are some of Mr 7's pencil drawings. 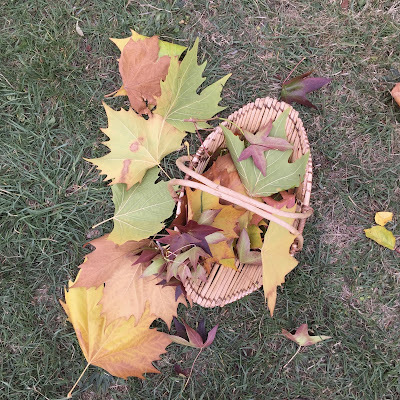 Autumn leaves was our 'Children Of The Valley' homeschool group theme this week too. We heard a lovely version of the story found in 'Tell Me A Story' which was called 'Mother Earth and the Leaves'. 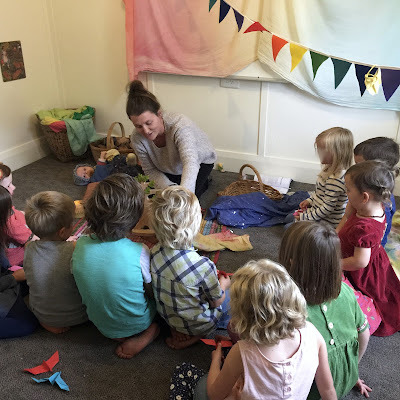 The children also helped to fold their own little colourful origami bird and each took home a sweet little felt oak leaf. 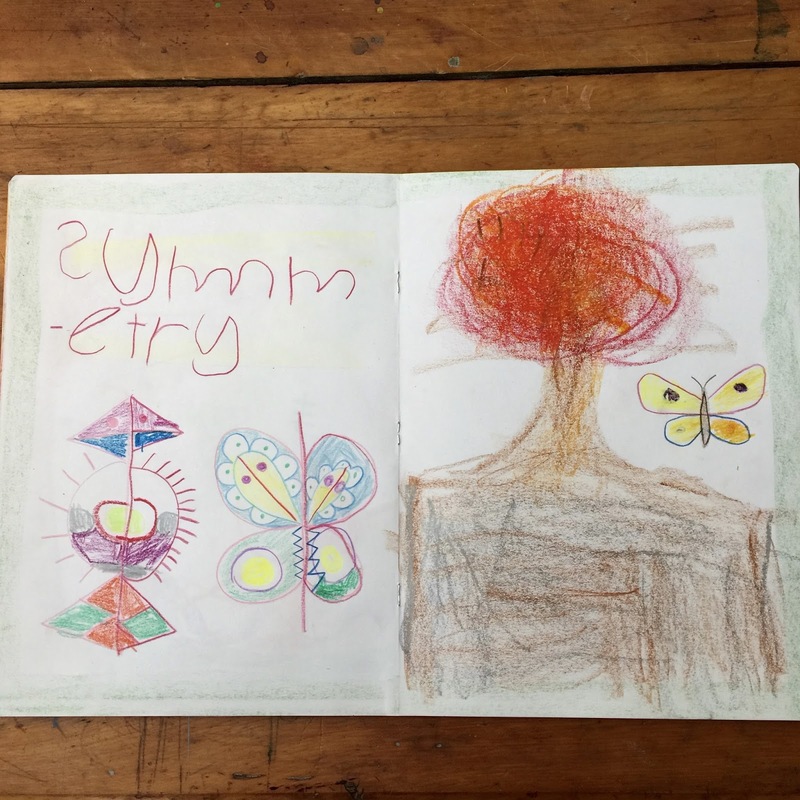 We read Chapter 9 of our Form Drawing story this week which can be found <here>. This week we practised a symmetry as our form drawing exercise and studied symmetry in nature by studying butterflies and leaves. 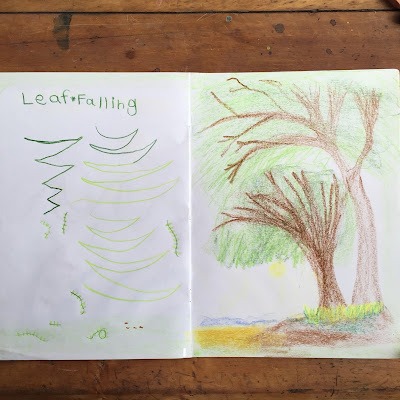 Mr 5's Kindy story was a version of Aesop's fable 'The Ant and The Grasshopper' which tied in nicely with a little exploration of insects and pollinators that we did this week, including this year's Autumn Wild Pollinator Count. Mr 7's main lesson work this week focussed on the 4 processes, with revision in Addition, and formal work on Subtraction. Mr 7 loves maths and picks up the concepts very quickly and easily. He used both math manipulatives and illustrated math cards, and did some work in his MLB. He is really enjoying the traditional Waldorf math gnome stories that accompany the concepts. 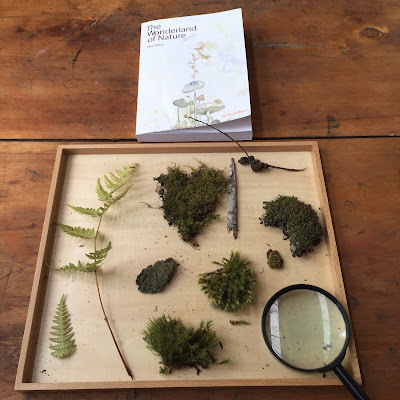 In addition to observing insects and pollinators this week, we also noticed what was happening in the Tasmanian bush that surrounds our house in Autumn and found some interesting fern and moss specimens to study. 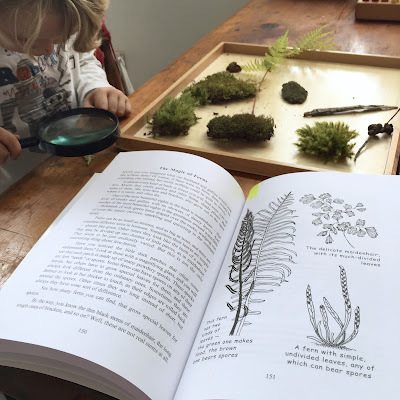 We read the 'The Wonderland of Nature' chapter on ferns and moss and discussed some of the differences between forest species of plants, fungi and animals in our area of the Southern Hemisphere and in the Northern Hemisphere. We continued our symmetry theme by exploring leaf symmetry and doing a wonderful and challenging exercise with some of our Autumn leaves. 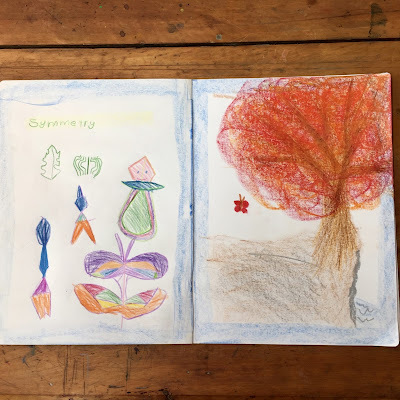 In addition to our symmetry drawing work, we did folded 'squish' paintings with poster paints which was another fun way to explore lines of symmetry and colour mixing. The Autumn leaves theme continued at our 'Children Of The Valley' homeschool group this week. 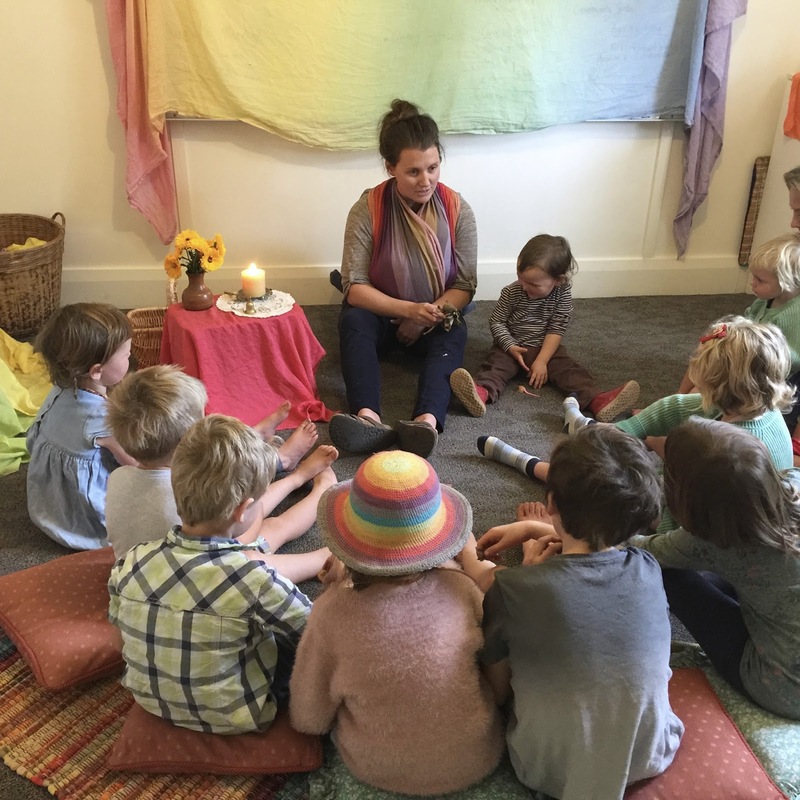 The children gathered around to listen to a lovely version of the story 'The Autumn Blanket'. We also took turns to dip Autumn leaves in beeswax to hang on our windows at home. The smell was divine! We read Chapter 10 of our Form Drawing story this week which can be found <here>. This week we practised a type of running form from the story which is called Trotting. This was a very challenging form for both boys to master, but they enjoyed the rhythmical element of this running form. This week Mr 5 really enjoyed the funny story 'The Wonderful Pumpkin', a retelling of a Turkish fairytale included in the Lavender's Blue 'Autumn' curriculum. In our wet-on-wet painting this week, we painted a pumpkin shape using orange and yellow and discovered how the colours wick into each other as they touch. It was challenging to keep the form of the pumpkin. Mr 7's continued with math as the main lessons this week, and formalised the math concepts of Division and Multiplication. Again, he breezed through this work very easily and really enjoyed working with the manipulatives. 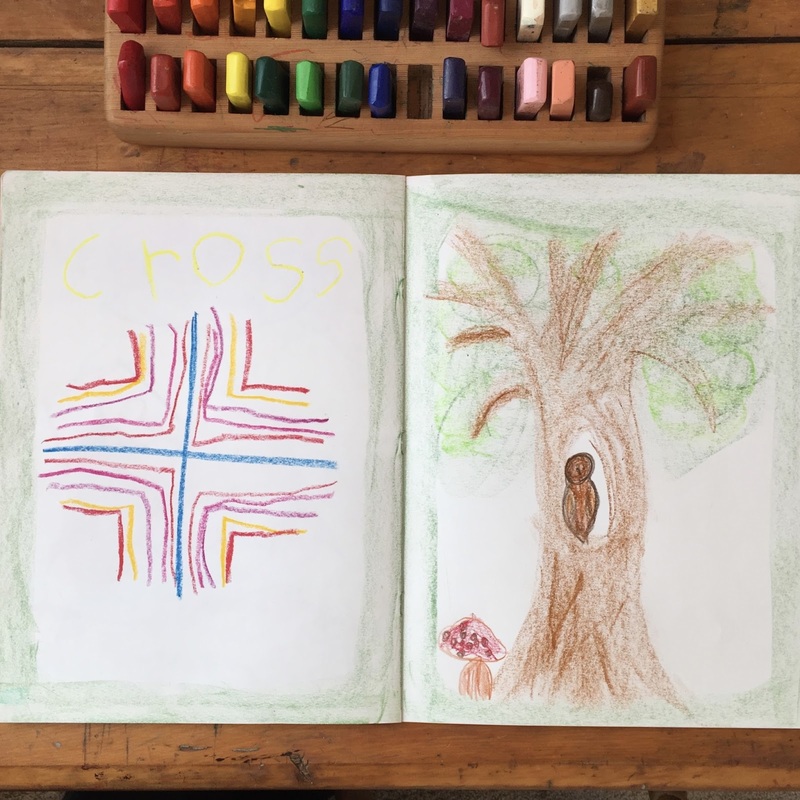 Mr 7 has been working on a series of willow trees as a self directed project. 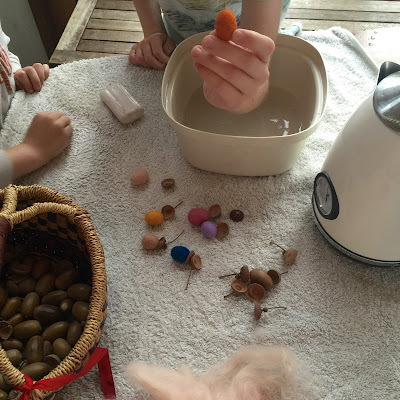 This week we also wet-felted little coloured balls of wool roving to make little acorns to use as party favours for Mr 5's birthday party on the weekend. 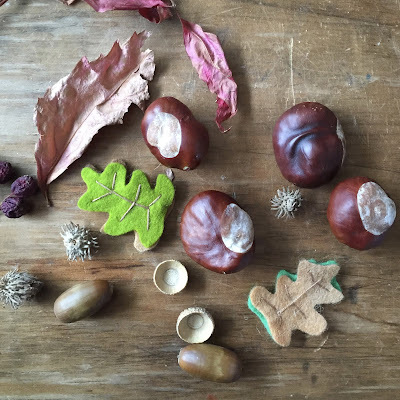 These were quick, simple enough for young children, and lots of fun to make! I also made some little wooden brooches with the children's name on them to include in their little party bags. 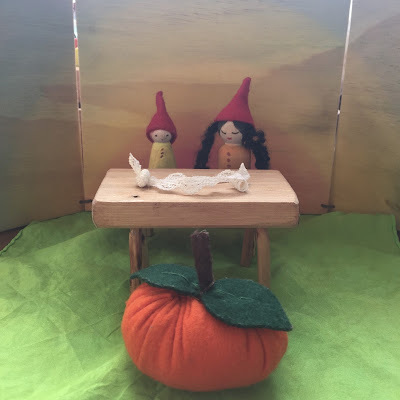 In our homeschool group this week, the children listened to the wonderful Russian folkstory 'The Enormous Turnip' a version of which can be found <here>. Tomorrow, I'll be six years old! Six kisses when I wake! Six candles on my cake! We read Chapter 11 of our Form Drawing story this week which can be found <here>. This week we practised a symmetrical form called Cross. This form of symmetry is known as rotational symmetry as the form rotates around a central point. Mr 7 finished up his work on the 4 processes this week (addition, subtraction, division and multiplication) with a little more practise on some more challenging sums. We also reviewed our mental math work and practised our skip counting by 2's, 5's and 10's. 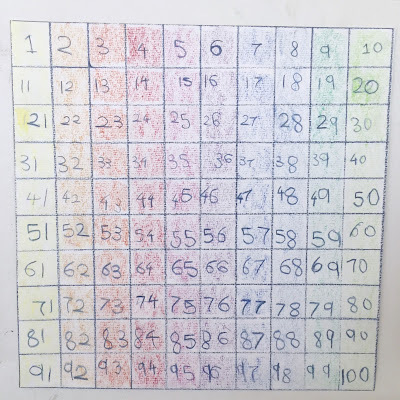 He finished his 'Number Patterns to 100' skip-counting chart. 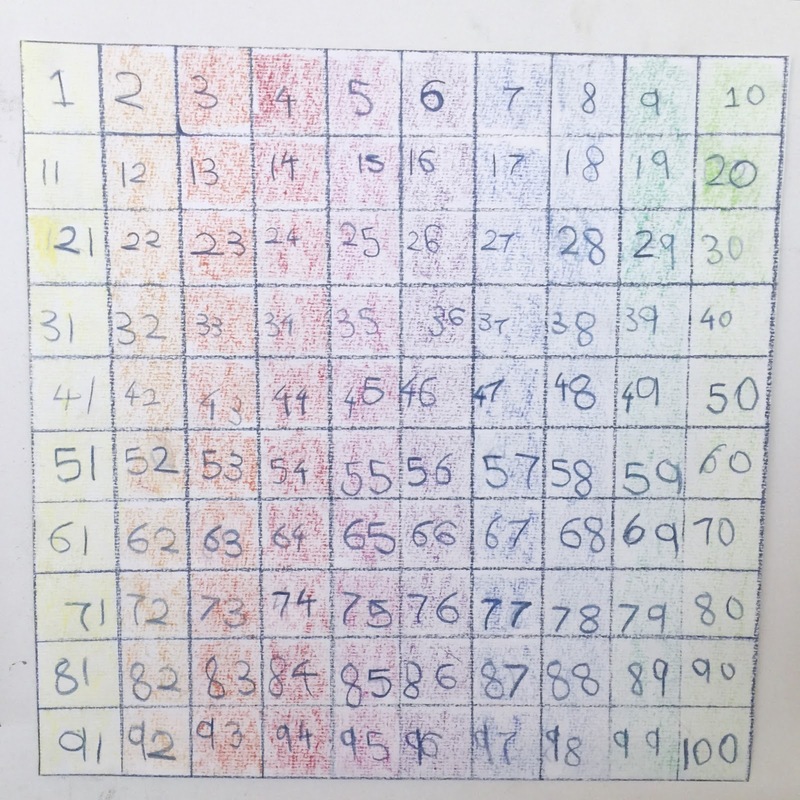 There are a number of fun ways to use this skip-counting chart, <here> are some ideas. 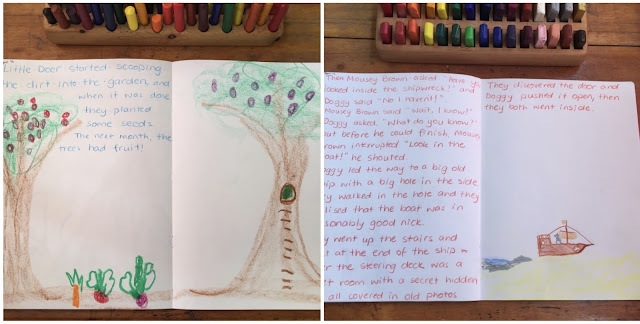 Mr 7 then moved on to work understanding Equals, with a great little story from the Oak Meadow Grade 1 curriculum about King Equals. Mr 7 and Mr 5 built their own King Equals scales with LEGO. 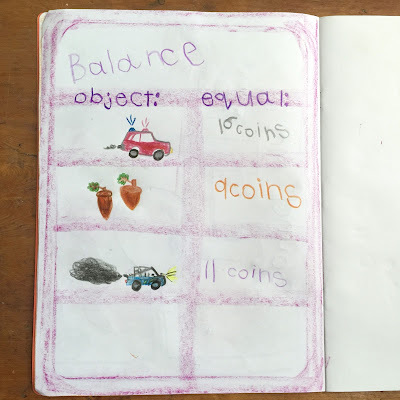 We used King Equal's scales for a fun afternoon activity comparing, estimating and weighing different materials and entering them into our MLB's. 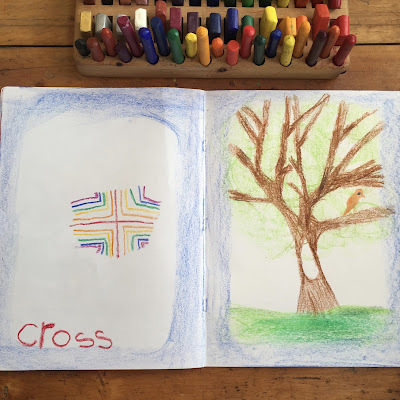 At our weekly 'Children of the Valley' homeschool group we had a lovely simple morning. We celebrated Mr 6's birthday during circle time with a simple little celebration. The children made their own walnut shell mice during handwork time and they spent outside play time creating little mouse nests for their mice in the garden by the cottage. To close the gathering, we listened to a sweet little harvest mouse story and the children used their own mice to help tell the story. This week we also had our first THEAC home visit for Mr 6. It went well and as usual the boys were thrilled to see the lovely Home Educator Assessor. This final week of April also marked another exciting and very momentous moment for Mr 7 - the official completion of the First Grade material that we wished to cover over the year! 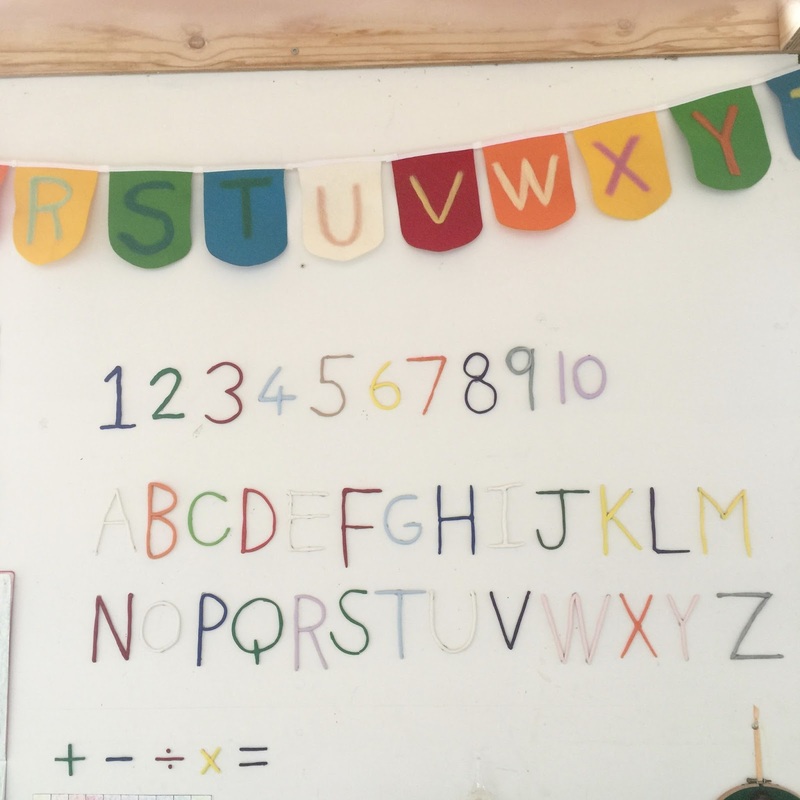 He has worked so hard in his First Grade year and it's so wonderful to see the progress he has made, and his pride and enjoyment in his work. This also completes our first formal year of home educating, and while we have certainly had our fair share of both wonderfully fun days and incredibly challenging days, it has been a journey I have been privileged to be part of. It is both surprisingly easy and amazingly tough being the person solely responsible for your child's education. 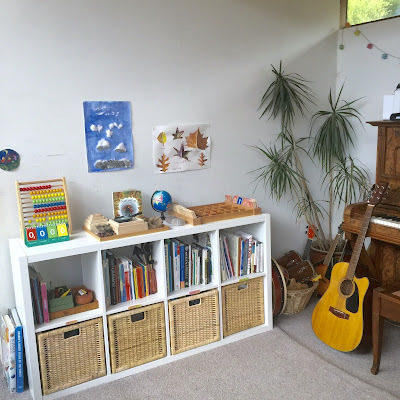 There are definitely occasional moments of frustration, overwhelm and doubt, which is why it is so important to connect with other home educating families for support, help, ideas and encouragement, and we have been so very lucky to find and connect with like-minded families in our area; but to balance those moments, there are so many things to love about this home education journey. I think the thing I treasure most is the relationship building and time we get to spend together as a family. The ongoing work balancing our own needs with the needs of the others we share our lives with is often challenging but always worth it. The very fact I am here to witness their joys and triumphs, as well as their frustrations and disappointments, is really very precious to me. I also value the non-competitive environment that they get to learn in. There are no tests, scores or pressure. They never "fall behind" and they don't even understand what is really means to compare their level or progress to anyone else's of a similar age. They learn at their own pace with 1:1 help and assistance when they need it, so learning is something they enjoy. They know it is flexible, fun, tailored to the own level and interests, and that we can take breaks or mix up the routine anytime. We value time. Time to work on self-directed learning projects. Time to draw, or paint, or create things of beauty. 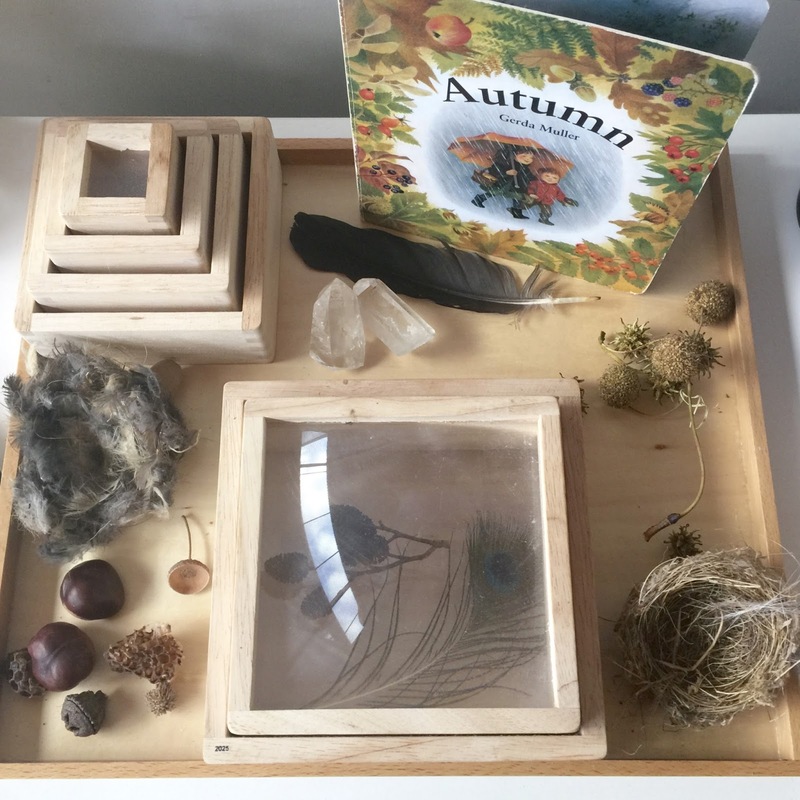 Time to learn through play and to move and to learn hands-on. Time spend outdoors in nature, bushwalking, climbing trees, building bush cubbies, turning over logs to see what lives underneath. Time spent in the garden, growing our own food, nurturing the soil, the plants and our bodies. Time spent free playing with friends all day, with minimal adult interaction or involvement. Home Education is so flexible and there is no doubt that children are wired to learn and that in a supportive environment with people who care about them, that learning is a process that happens continually and organically.